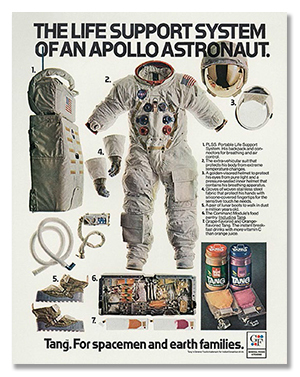 "Don’t think for a moment that NASA masterminded a PR campaign that brought the Apollo missions into our living rooms. Just like everything else about the Moon program, how—and how much—to share Apollo with the public was a learn-as-you-go affair that involved not only NASA’s public affairs office but top NASA managers and even astronauts. As this excellent and informative book details, even the idea of live television from the Moon was a matter of heated debate, and there were moments when it might’ve gone the other way. 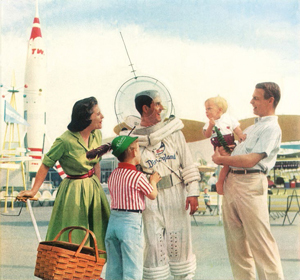 Thank heaven it didn’t: When humans first voyaged to the moon, they took the world along." "To call the Apollo Program the greatest marketing exploit of the 20th century is not hyperbole, but, as David Meerman Scott and Richard Jurek show us, simply a statement of fact. Thanks to this thorough and detailed account, we can better understand not just the talent and dedication of the Mad Men-era professionals who sold the Moon to a global public, but also the larger transformation of statecraft into stagecraft, and the enduring and irreversible transformation of the public sphere into an enterprise of image creation, and manipulation." "We have long known that NASA mobilized a broad public relations campaign supporting the Apollo program of the 1960s. We have not known until now, with the publication of Marketing the Moon by David Meerman Scott and Richard Jurek, the details of the campaign. Scott and Jurek offer a compelling account of these great efforts, informed by interviews with many of the participants, and well-illustrated by unique imagery and documents." "President Kennedy hoped the nation would succeed in sending a man into space and landing on the Moon. Though he did not live to see it happen, his dream was fulfilled. David Meerman Scott and Richard Jurek’s Marketing the Moon shows us in vivid detail what it took to make this happen. This is one of the great stories of the 20th century." "Marketing the Moon is a fascinating look at how NASA and its partners brought the Moon to the world’s living rooms. Apollo’s revered place in the collective imagination stems, in large part, from the efforts detailed in this book. " "Marketing the Moon is a story of the challenges and ultimate success of marketing one of the greatest achievements in American— and world—history." "Something profound had changed since the early days of the heroic, untouchable space heroes. 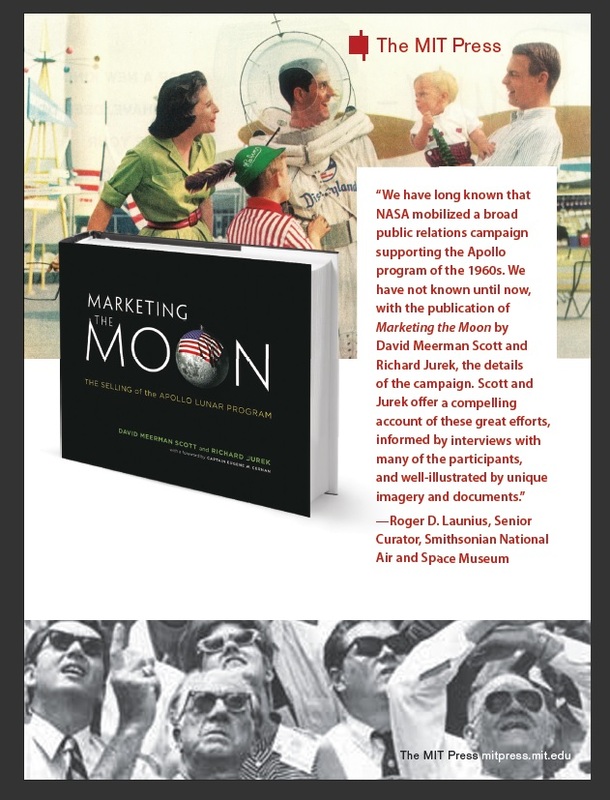 In Marketing the Moon, David Meerman Scott and Richard Jurek do a masterful job defining that something and placing it within a much broader exploration of how the U.S. space program acquired such mythic status in the first place—before it abruptly, sadly crumbled away. Along the way, the authors achieve something I doubted was possible: They provide fresh and important insights into the Apollo program, nearly half a century after the fact." “Marketing the Moon,” written by two P.R. professionals and space enthusiasts…chronicles the public-relations triumphs and disasters that, in many ways, determined the fate of the Apollo program. Usually, Apollo is presented as a story of technological derring-do. Scott and Jurek see it as a sales job: an attempt to convince America, and the world, of its own competence, intelligence, and courage. It was the astronauts and engineers at NASA who possessed those qualities, not the rest of us—and so it fell to public relations, and, specifically, to television, to help us share in them." "Marketing the Moon records elegantly and precisely such details, but it tells an important and generally understated sociological story of how the Apollo program changed the way we see the world in a different sense too: it introduced new expectations of 'live television', of unedited audio transcripts, or direct access to experts and officials. All this openness was remarkable in the context of a space program launched in the shadow of the fiasco of the Bay of Pigs invasion and driven by the military's need to 'beat the Russians'." "...a well-written look at how NASA, industry, and the media covered the Apollo missions..... Marketing the Moon provides a fascinating look at the marketing of humanity's first missions to the Moon, as well as a reminder that space exploration, including first-of-their-kind missions to other worlds in our solar system, do not sell themselves." "It's finally been written, how a bunch of government-types who never worked for the government managed to market and create a brand known as NASA with the mission, "We choose to go to the moon," and we did. Twenty-four American astronauts flew from Planet Earth to the moon and twelve astronauts walked on the moon. It was done with the press and everyone watching around the world. A new book entitled, "Marketing the Moon," by David Meerman Scott and Richard Jurek is just out and it is a must read for all who followed manned space flight in the 60's and 70's." "...a newly published book with a fresh take on Project Apollo...."
"...Flipping through the pages of Marketing the Moon is like binging on "Mad Men" episodes..."
Science Editor, NBC News Digital "How NASA Sold the Moon, and Why It Can't Seem to Sell Mars"
"The book tells an entertaining and engaging story, but there's a lot to learn from here, as well...And it's a beautiful book. Lavishly illustrated, it's a book for the coffee table, the office desk, the lobby. Full-page illustrations; covers and excerpts of glossy magazines from the era, as well as full-page 'asides' on related topics: Disney's Tomorrowland; the '50s sci-fi television series Space Patrol; Soviet Russian efforts to inspire with elaborate futuristic space films of their own. And much more...The text boxes and asides are just as fascinating and informative as the main narrative itself. And it's impeccably researched: from how reporters with low-budget media improvised launch coverage, to how contractors ingeniously pioneered new methods of colour photography. The authors leave no stone unturned - not even moon rocks, whose complicated fate in international diplomacy they chronicle as well. Those with an interest in marketing and complex project management will find the book particularly interesting, but it's accessible for the general public and will enthrall any space enthusiast." "A unique and fascinating book."